The winner was Debbie Nicholas from Durham. 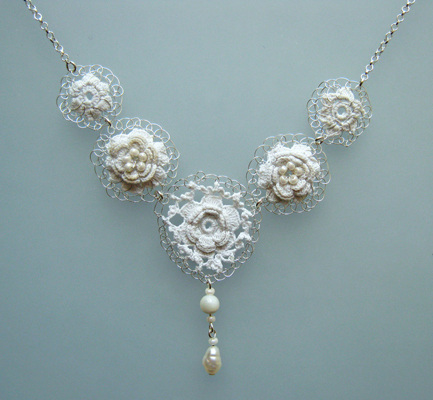 This Fiorenza necklace from the Vintage Lace Collection, made with vintage Irish crochet lace and silver is on its way in the post. "I am renewing my vows with my hubby (we have been married 12 years) so this is going to be the perfect accessory!!" I'd like to wish Debbie and her husband a fabulous day. Congratulations! Thank you so much Judith, it arrived this morning and its so delicate and beautiful i just keep looking at it!! I really cant wait to set the date now to renew our vows - everything is coming together perfectly! !